The other day, I saw a curious full-page advertisement in the copy of Ottawa Life magazine that came bundled with my morning Globe and Mail. It contained phrases and symbology that I am no longer accustomed to see. What caught my eye at first was the red background, complete with five-pointed golden stars and an image of a statue containing a group of heroic figures. Stuff once common on the wrong side of the Iron Curtain. 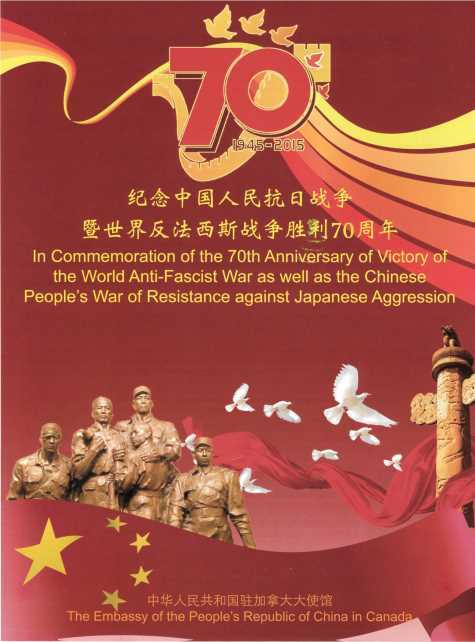 Presented by the Embassy of the PRC, it was an advertisement in commemoration of the “Victory of the World Anti-Fascist War” as well as the “Chinese People’s War of Resistance against Japanese Aggression”. Symbology and awkward language notwithstanding, knowing what I know about the brutality of Japan’s failed conquest of the Middle Kingdom (including the use of chemical and bacteriological weapons), I believe China has every right to celebrate proudly. Western bias notwithstanding, arguably the true starting date of World War 2 is July 7, 1937, the beginning of Japan’s attempt at a full-scale invasion, and it took a full eight years for this nightmare to end (though not the Chinese Civil War).